Bennington College is a progressive liberal arts college in Bennington, Vermont. Every year, attending students must complete a seven-week internship as part of their Field Work Term (FWT). This term allows students to test their interests and find out what it’s like to work in the professional world, while also building a resume. As a composer from the Bay Area, I decided to apply to intern at the Center for New Music. I was accepted, and given the opportunity to focus on production. I’m finding that the Center for New Music is fulfilling an incredibly useful role in the San Francisco new music scene. There are few, if any, committed venues for new music outside of the popular music spectrum. C4NM has created a space that is completely dedicated to modern and experimental music of all kinds, including jazz, bluegrass, and classical. 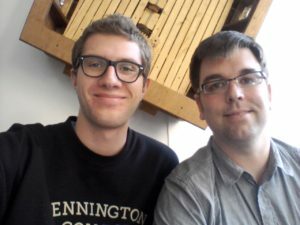 My supervisors, C4NM co-founders Adam Fong and Brent Miller, are communicative with younger musicians like myself and are really trying to grow a more collaborative and involved new music community in the San Francisco Bay Area. It’s important to me that their be venues like this so that the classical music scene can grow. Every major city has galleries and theaters, but finding a space where new music is performed regularly and with dedication is a rare and recent thing. Brent Miller, one of my supervisors, and me. We are not related. C4NM concerts are fairly informal, but I believe this encourages dialogue between the artists, stagehands and audience members. Since I’m interning in production, I worked with a fairly large slew of artists over my first week and a half, and the conversations were always friendly while still maintaining a professional air. So far, each concert I’ve attended has gone smoothly and ended with a period of post-concert chatter between the audience and artists. This vibrant and intellectual atmosphere carries throughout the Center on weekdays. It keeps me updated on the local scene and gives me an opportunity to hear the thoughts of my peers and elders. My own ideas are changing and becoming more educated through my conversations with C4NM patrons. I’m finding many differences between East Coast and West Coast preferences and ideas. For instance, my admiration of Nico Muhly’s music is oft shared at Bennington, but his impact on San Francisco seems to be considerably smaller. 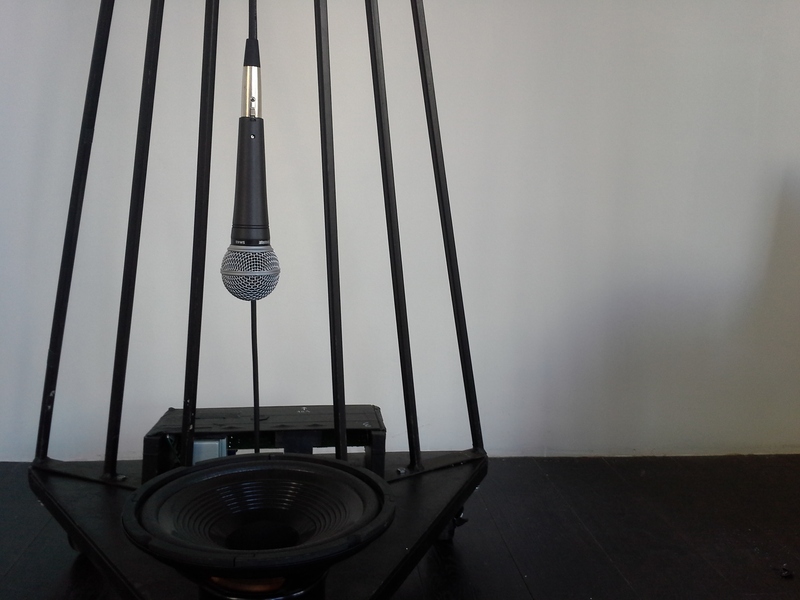 A microphone set up to perform Steve Reich’s Pendulum Music. Visible in the C4NM window. Later this month the Kronos Quartet will be giving an open rehearsal at the C4NM. As part of this, they created a window installation of a handful of unique instruments that the ensemble has used throughout their career. 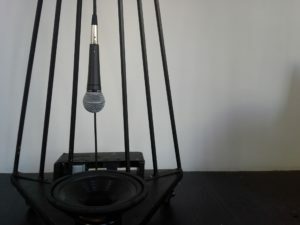 The exhibition includes a microphone hanger for performing Steve Reich’s Pendulum Music, a double-necked cello, and a violin painted to look like a raging sea. I was involved in the installation, which was a strange experience for me as the Kronos Quartet is one of my favorite ensembles and are musicians whose work is extremely important to me. To be working with their crew in such a casual way really brought to light how relaxed and friendly the music community can be. It’s becoming very clear very quickly how I could function in the music community after college, and take my place in it.